Tom Delonge, Dalek, Persue, Tim McCormick, Neko, John Grow, Justin Heit, Brendan Raasch, Kelli Murray, Brent Sandor, and Monica Hoover. Featured in the upcoming exhibition “Creative Visions” at the Voice 1156 Gallery is a collaboration of artists from both Macbeth Footwear/Optics and Jedidiah Clothing. The artists involved are all affiliated with one or both of the companies through ownership, employment or freelance work. This lineup of all-stars is responsible for the creative departments of their companies, bringing to the public some of the best illustration, design and photography in the action sport industry. The artwork showcased is an insight to what these artists are up to in their downtime aside from their normal commercial engagements. The artwork in “Creative Visions” consists of an assortment of painting techniques on traditional canvas and unconventional surfaces, as well as photography in collage form and on experimental background applications. Visit the archive to view artwork and merchandise that was available during the Creative Visions show. Thomas Matthew DeLonge, Jr., better known as Tom DeLonge, is the founding member and the guitarist for the San Diego based, punk-rock pranksters band Blink-182. DeLonge has also played in a side project with fellow band member Travis Barker in Box Car Racer. When Blink took an indefinite hiatus in 2005 DeLonge started a new band Angels and Airwaves that promises to bring a new sound to rock with a larger then life concept album that debuts May of 2006. But DeLonge is not solely a musician. He uses his talent in many genres, which include, creative director for MACBETH Footwear and Optics Company, an activist for youth voting, video direction, architecture and art. You may have seen some of his artistic works used to help charitable organizations such as the Keep A Breast Foundation, where his art that adorned a mold of his wife's breasts was auctioned off for over nine thousand dollars to help breast cancer research. In addition to this, DeLonge and MACBETH's art director, Kut U Up's Brendan Raasch, have designed a limited edition MACBETH t-shirt for this election year known as the "Vote Me" tee, each shirt sold raises funds for the non-profit organization Rock the Vote. The artwork Hoover is showcasing in ‘Creative Visions’ is a photo-collage series titled “Weapons of Mass Construction.” These Black and White images are attached to 4’x6’ wood panels and are combined with photo emulsion transfers and stencils. The subject matter takes on a documentary approach of Hoover’s experiences of different artists that express their voice utilizing different mediums and methods. Hoover hopes to shed some creative light by encouraging artists to think of their art as a weapon of mass construction, for sake of awareness, as well as encourage non-artist viewers to take on some means of activism. Monica Hoover is a powerful force, or ‘voice,’ one might say, in the San Diego art community. 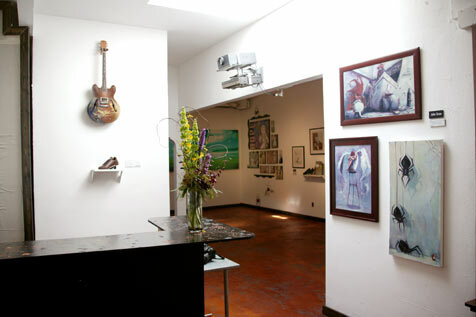 In July of 2004 Monica opened the VOICE 1156 gallery and photography studio in downtown San Diego. 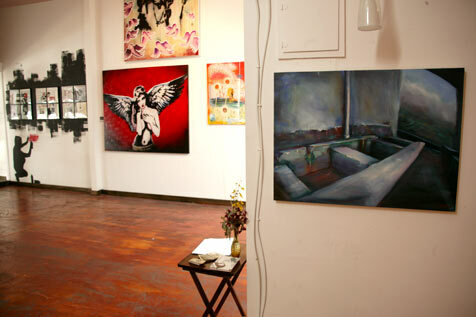 Her aspiration for the gallery is that it will function as a springboard for success for all creative individuals involved and provide a space for people to experience art on a level that is not currently represented consistently in San Diego. An Animal Rights enthusiast, and feminist at heart, she exercises and encourages the mantra: ‘practice creative activism.’ A Philadelphia transplant with a photography and architectural background, Hoover made her way to San Diego in1999 in the middle of the BLK/MRKT Inc. distribution frenzy. Working side by side with the infamous Shepard Fairey of OBEY and Dave Kinsey, Monica was a feminine VOICE to Blk/Mrkt. Hoover's photography has been used for advertising for such companies as for Macbeth, Vans, and Harvey Industries, as well as dabbed her toe is some design work for Jedidiah Clothing, just to name a few. When it comes to Hoover’s fashion photography, she takes on a life-style conveying approach. She is not interested in making people look like objects, rather powerful, beautiful and proud of their sexuality. John Grow is a San Diego native who studied illustration in San Francisco for four years. 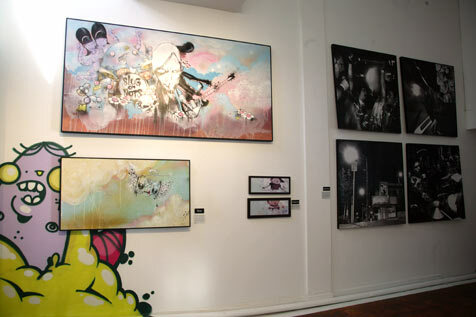 Grow’s four oil paintings exhibited in “Creative Visions” are conceptual pieces that he currently has been doing for himself as well as commercial companies. John does freelance illustrations for such companies as Jedidiah Clothing, Osiris Shoes, Tribal Streetwear and Malchers. Born into the simultaneously mundane and surreal heart of sunny southern California, Tim McCormick spent his earliest years in the bizarre Hollywood suburb of Burbank. McCormick states, “My work is an expression of my personal thoughts and feelings presented from a hyper sensitive point of view. My attempt is to connect with the viewer by "putting myself out there first", I hope this can make people feel more comfortable about what they are going through in their own life experience.” Tim McCormick's work reflects a unique perspective on issues of fame, pop culture, and self. 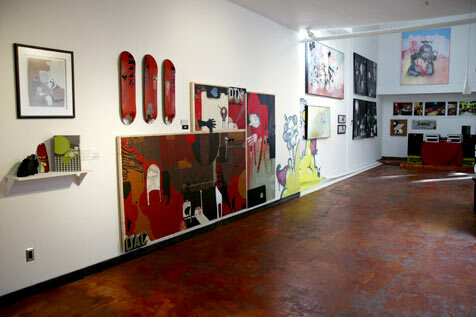 Regarded as a standout within the Southern California art scene, McCormick currently exhibits extensively in Los Angeles, New York, and throughout the greater (and lesser) U.S.
Born and raised in San Diego, Brent Sandor’s artwork is influenced equally by the streets and by nature; an oxymoron of grit and beauty. Bold colors coupled with grimy textures invite the viewer to experience balance. Sandor concludes “If you look hard enough, you can almost always find ugliness in the process that creates beauty.” Sandor’s art can be seen in various art shows as well as on the streets of southern California. In “Creative Visions,” Sandor will be exhibiting a series of screen prints influenced by graphic design, graffiti and his life. Attributing growing up in the action sports community and tuning into his love of art, Sandor currently works as an illustrator and designer, contributing designs to companies such as Jedidiah Clothing, Planet Earth, Xcel Wetsuits, Academy Snowboards, and various skate shops. Sandor is one of the original founders of the dying art collective as well as a VOICE 1156 compatriot - family. Brent thanks his continuous inspirations…God, Andrea, Neko, Monica, DAC Project, Voice 1156, family, friends, snow/skate/surf communities, streets, nature, graffiti, sketchbooks, every artist struggling to make it and all of those who have. Neko’s devotion to painting discloses his inner agitation of his influential surroundings. "I've made art my ritual, my life. While painting, I discover meaning and truth, a personal exploration of myself, my surroundings, and the interaction between the internal, the rational and the emotional."?? Rich earth tones, roughly textured canvases and geometric shapes that complement a dark mixture of abstract characters and temperamental lines conspire as a trademark of Neko. Neko is a self-taught artist who grew up in Golden Hill, moved to East County then back to Golden Hill. His many encounters with weak, low self-esteem women, drugs, and dirty money have become the subjects of his larger than than life paintings. Neko is also known for his characters affectionately called “sluts”. When Neko isn’t painting he works construction, builds furniture and is one of the VOICE 1156 Curators. 21 year old San Diego native, Murray graduated from FIDM (Fashion Insititute of Design and Merchandise) in 2005 and currently continues her art career as head designer for Jedidiah clothing company. Murray admits that fashion and graphic design were her first trades, but through painting she has found her new love. Unique to Persue’s usual painting style and relevant to the Bunny Kitty story, the art exhibited in Creative Visions consists of two pieces that Persue considers ‘side projects’. Persue explains that his “Slug or Nots” piece is a tribute to the band that exists in Bunny Kitty land, - Bunny Kitty’s favorite band. This band in reality exists, headed up by Persue and his brother Gunner (more formally know from the band Dare Devil Jane). Slug or Nots are currently planning to record their first album. The piece titled “Ghetto Blaster” was inspired by the lack of good music on the radio. “Ghetto Blaster” artwork can also be found through Jedidiah supported artist series clothing line. Anyone who knows him can tell you that his artwork is a reflection of his personality. His animated and fun-loving demeanor, as well as an intense imaginative way of looking at the world around him, are the building blocks of his work. A traditionalist, Persue paints on the streets, and quotes, ‘Graffiti is the foundation of my life,” but has more recently meshed that background with a rough-edged illustration style to create works for galleries. In 1992, Persue began working in the action sports industry. His career started while painting a wall in a skateboard shop. An employee recognized his talent and called a friend, Ken Block, who was starting a company called Eightball (now DC Shoes). Persue started freelancing t-shirt graphics, which paved the way to skateboard and snowboard graphics, which led to his current position as a footwear designer for Osiris Shoes. In 2003, Persue started a company called Bunny Kitty with his girlfriend, who is a UCLA graduate with an addiction to sewing and knitting. While painting Bunny Kitty at the 2003 New York Wall of Fame, Persue was introduced to the guys at Kidrobot who were starting a toy called the Dunny. Bunny Kitty was included in the limited edition first series Dunny. The Bunny Kitty Dunny was the starting point for the company’s website, signature hand made totes, apparel, accessories, and much recognition. Photography for Justin Heit is a tool of inspiration that he utilizes regularly in his more accustomed trade of graphic design. “Great design focuses around powerful imagery” says Heit, as he explained to VOICE 1156 of his love of photography. 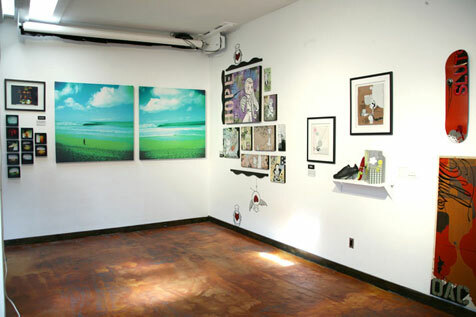 Heit’s imagery exhibited at “Creative Visions” was initially a personal project but has recently found its way into the published public eye of Surfing Magazine and an ad campaign in 2006. His $20. Holga is the camera responsible for generating this imagery. His crossed processed prints that expose multiple landscapes, reveal the many journeys and perspectives of Heit’s lifestyle, be it working or leisurely related; varying from remote cactus formations of the Pacific Ocean side of Cabo San Lucas, Mexico to the Hawaiian 30’ to 40’ face waves where hundreds of photographers compete for a similar photograph, yet everyone’s is different. Heit is the founder, owner and Creative Director of Design Agency ‘Punch Stain’ and he has recently partnered with Tom Delonge in the designing and development of Macbeth Optics. Dalek is among a breed of artists whose work is stimulated by the old school styles of graffiti. A self-taught painter who was born in Brooklyn, NY, Dalek discovered graffiti in 1994 in the rail yards of California and later in Chicago, where he attended the Art Institute and received his BFA. While Dalek executes this style of art in the obscure and urban environment of the streets, he also takes it to new gallery arenas, exposing his work to new audiences. Embracing inspiration from street art, graffiti culture and television, his work transcends the borders between Street Art and High Art. Dalek’s work features his strange yet appealing trademark character, the Space Monkey, who encounters vibrant geometric landscapes, mysterious holes and futuristic battles. The works evoke a subconscious world filled with Japanese influence and charged with energetic pop colors. The enigmatic Space Monkey, which has become synonymous with Dalek’s name, was born out of graffiti, but has been transformed in the mediums of paintings, toys, silkscreens and housewares. In addition to working as an assistant to Takashi Murakami, Dalek’s work has been shown in galleries across the country, and can be seen all over the wall and highway overpasses of various U.S. cities.